Please share with us briefly what you do. I am the Founder of Snaphunt.com which is an intelligent hiring platform that matches talent to roles for a skill and culture fit. Before Snaphunt, I have almost 20 years’ experience within consulting, banking and specialist recruitment across multiple geographies. I was previously the Executive Director for Michael Page Geneva, the Managing Director of Michael Page Singapore and India as well as Managing Director- Asia for Hudson. Describe your product. How does it work? For job seekers, Snaphunt acts like a job search concierge. Once they have signed up and completed their profile, they no longer need to spend hours looking at job boards- Snaphunt will propose them jobs that match their profile and they can apply or decline with a simple click. Snaphunt also brings a lot of transparency to recruiting by providing job seekers real-time updates on the status of their applications. For employers, Snaphunt acts like a specialist recruitment firm but without any human recruiter. On Snaphunt, a recruiter can generate the perfect job advertisement in just a few clicks and then sit back while Snaphunt sources and screens talent for them. 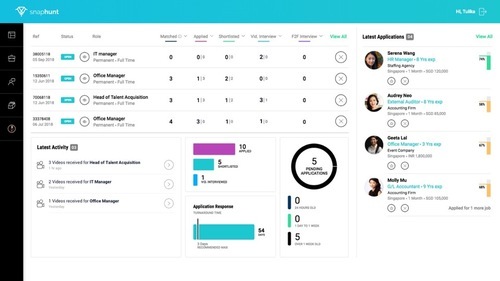 Snaphunt notifies the recruiter when they have matched applications and these can be further screened by conducting prerecorded video interviews on the platform before inviting the final shortlist for face to face interviews. Furthermore, creating a job to getting a perfect shortlist can take at times only a few hours! Snaphunt makes recruiting faster, more convenient and more accurate for everyone involved. 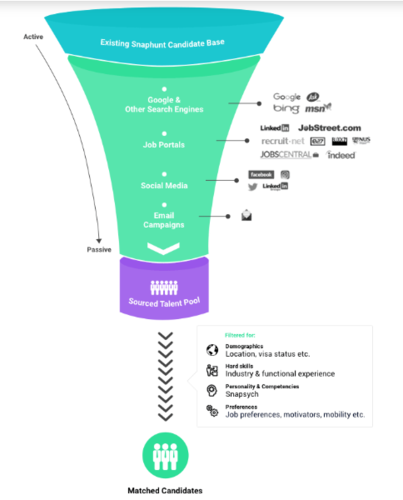 Apart from this, for a job seeker, Snaphunt gets rid of the CV blackhole and brings more transparency to the process. For an employer, Snaphunt drastically reduces a lot of the manual tasks involved in recruiting and reduces hiring costs by more than 90% as compared to agency recruiters. Snaphunt competes with tradition specialist recruitment agencies and is basically like a recruitment agency with AI algorithms instead of consultants. Who is your first customer and how did that happen? What were they using before this, and why did they switch? Our first customer was one of the world’s leading IT services firms. We approached them to try us during our beta as although they already had an RPO solution in place, they were still struggling to fill some critical roles. Over a period of 3 months, they found more than 30 candidates to interview for various tough to fill roles and then decided to supplement their current solutions with Snaphunt once we went fully live in September. I believe that everyone deserves to find a job they love. This enriches their lives and the lives of those around them. Also, if organizations could find the right talent more quickly and conveniently, I believe, unlock the enormous potential for them make a stronger impact in their own industries. I felt that We are in a unique position to leverage technology to help individuals and companies achieve these outcomes. What is your biggest sacrifice to make this work? There were a number of sacrifices along the way such as financial sacrifices that come with leaving a well-paying job and bootstrapping a startup and sleepless nights before going live however the journey so far has been more than worth it. We chose to bootstrap Snaphunt and hence my Tech Cofounder and I invested our personal savings into Snaphunt. We are now closing our first round of external funding with a VC that we are very excited to partner with and will be announcing this soon. Work of mouth and referrals. We have grown completely organically so far and are focused on delivering outstanding value to both job seekers and employers so that they recommend us in their networks. This really varies but usually involves some client meetings, product reviews with the tech teams, creating some content for our social media platforms and handling various issues with the business support teams. What has been your proudest moment in the history of your business and why? We made our first placement, a Head of Sales role for a sports foundation in our second month of going live with a beta version. This was a fantastic moment as it was our first validation that our product worked and provided great value to employers and job seekers. What is your favourite business failure (and what did you learn from it)? There have been so many, as there has been a continuous series of successes and failures in each of my role. I personally have learned more from my failures than successes and I think the piece that I carry with me the most is that both failures and successes are part of the journey. Failure usually precedes success so the failure as such really doesn’t matter- what you do about it does. If you could go back in time to speak to your 20-year-old self, what would you tell him/her? I would tell myself to enjoy the ride and that everything will be ok in the end. If it is not ok, it is not the end. What’s one productivity hack you can’t live without? Where can people find out more about your product offerings and you online? Math tutor to children with learning disabilities when I was 14. My father. He has had an extremely successful career and yet remains humble and very grounded. He is also very open-minded and continues to learn and grow every day. I love Quentin Tarantino and absolutely adored Kill Bill. Other favourites include Inception, the Matrix, and Interstellar. I read a lot of fiction- favourite authors include David Baldacci, Jeffrey Archer. My MacBook Pro. Can’t live without it! Trip to India over Christmas to spend some time with my family. When you are not at work, where can we most likely find you?